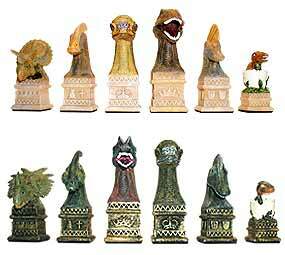 This beautiful, dinosaur-themed chess set is perfect for the palaentology enthusiast or collector. This specialty set is resin casted and hand painted with intricate detail. Each piece is individually weighted and felted. Does not include a chess board. KING: Tyrannosaurus Rex/Dilophosaurus QUEEN: 2 Pacycephalosaurus’ BISHOP: 2 Parasauralophus’ KNIGHT: Lambeosaurus/Corythosaurus ROOK: Triceratops/Sytracosaurus PAWN: 2 Hatching Maisauras. Tags: board, chess, game, king.